ensure we are globally consistent. 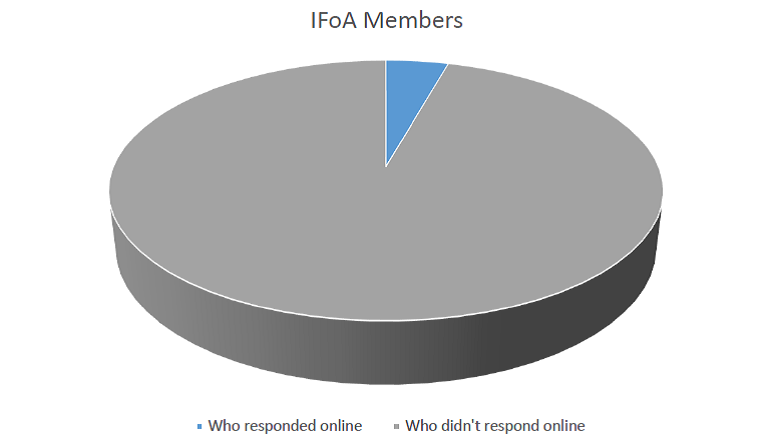 60% of 68% of 1,300 is 530 members, who appear to have effectively blocked something which was clearly in the long term interests of the IFoA and its members as a whole. Even if we accept that some of the other 1,000 other face-to-face consultations had some bearing on the decision, is this really how we want to determine the future positioning of the profession in a crowded market place? As Daniel Susskind suggested in his recent professionalism lecture, the future will be different. If we cannot respond to it rather better than this, we may not be part of it for as long as we might hope. We will continue to consider the designation Chartered Actuary (CAct) as a rebranding of our Associateship (fully qualified actuary) member grade. Over the next few months we will engage further with you, so that we can clarify Council’s thinking on the competencies of CAct and CAct/FIA/FFA and directly address the concerns expressed by Fellows about perceived implications for their status. We will do this before coming to any final decision on our CAct proposal. So there is all to play for. It will require us to start behaving like a generalist actuarial qualification is what we want, and offering roles for actuaries on completion of core practice modules in future. It will mean not necessarily insisting on further actuarial specialisation as a requirement for senior roles within our firms. It will mean getting comfortable with a much wider range of specialisms amongst those we consider to be actuaries. Some are already doing this, but most of us need to go much further. At the University of Leicester we believe our MSc programmes should be focused not only on core principles and core practice modules but also allow students to explore other possible areas of further specialisation not currently within the actuarial syllabus, alongside the softer skills employers want to see. We will continue to discuss the details of this approach with interested employers and listen to what they want to see in the graduates they employ. But I predict that the compelling logic of the CAct qualification will prevail eventually, whatever 500 Fellows think about it.